Winner of 2016 BMA Medical Award for Basic and Clinical Sciences The Epigenome and Developmental Origins of Health and Disease synthesizes the existing knowledge on how the in utero environment could be the most important environment in shaping later risk for various diseases or to conversely promote the health of the offspring. 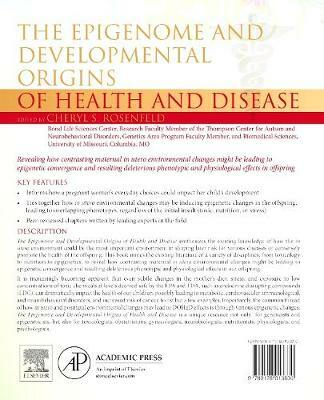 The book mines the existing literature from a variety of disciplines from toxicology to nutrition to epigenetics to reveal how contrasting maternal in utero environmental changes might be leading to epigenetic convergence and the resulting deleterious phenotypic and physiological effects in our offspring. It is increasingly becoming apparent that even subtle changes in the mother's diet, stress, and exposure to low concentrations of toxic chemicals at levels deemed safe by the EPA and FDA, such as endocrine disrupting compounds (EDC), can dramatically impact the health of our children, possibly leading to metabolic, cardiovascular, immunological, neurobehavioral disorders, and increased risk for cancer to list but a few examples.